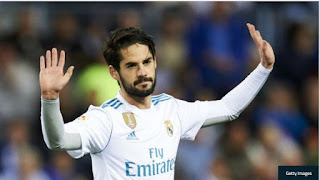 Spain midfielder, Isco, has claimed that he is “not going to speak to Cristiano Ronaldo again”, after his Real Madrid team-mate scored a hat-trick for Portugal against them. Ronaldo scored all the goals for his country, as they fought back to draw 3-3 with their Iberian neighbours. “Don’t talk to me about Cristiano! “I’m not going to speak to him again after what he did the other day. “He doesn’t have a high strike rate [from free-kicks], but when he has his day… his first two goals gave him confidence and got him looking for his hat trick,” Isco told Cadena SER. Spain’s next Group B fixture will see them face Iran on Wednesday.